In the 4-week Level II – Women’s* Self-Defense Intensive, participants learn how to assess situations, drill techniques, and practice responses to intense and dangerous confrontations. We will review basic Level I skills, and then focus on escaping from pins and grabs, dealing with weapons, fighting from the ground, and multiple attackers. Our goal is to create an environment where students can face, work with, and begin healing their fear of violence. The verbal, physical and emotional skills practiced are designed to empower folks to create more options for themselves and make choices that keep them safer in the world. Completion of Level I Self-Defense Series or previous self-defense experience highly recommended. Registration will open once dates for 2019 are confirmed! Join our email list to be notified about the next class series! *Women’s Self-Defense classes are open to women and girls self-identifying as female including transgender and non-binary individuals. 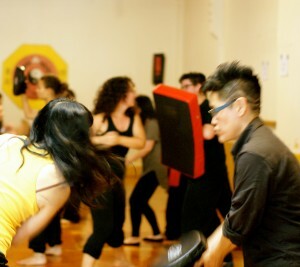 We also have classes open to all genders and male-identified students. Please email our director at selfdefense@handtohandkajukenbo.com for more information.